This post is consistently my most popular. I keep imagining growers everywhere searching for a good system for growing cucumbers, and stumbling across my blog. We're growing cucumbers again this year, and I'm betting that somewhere within the next week or two the trellis will go up again. We're also trying our hand at squash and watermelon on the farm, and I'm pretty excited. I'm sure the farmers I work with will have some ingenious plan to implement. They are so inspiring! Cucumbers are this years experimental crop. In years past, the farmers have not had much luck with the Cucurbitaceae family. Squash and watermelon succumbed to powdery mildew, and cucumber apparently has been a particular challenge for generations. Humidity and drought, disease, and the occasional roaming oni (a ghost that seems to enjoy eating the flowers before we get nary a bite) bear the blame. This year, though, with well-prepared soil, crossed fingers, and some friendly thoughts for the neighborhood oni we put in a single row. 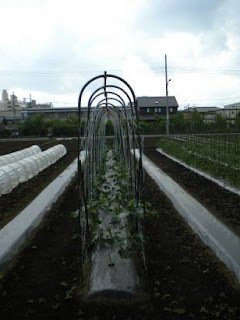 Given the size of the farm - large by urban standards but small by country ones - the farmers like others in the area make good use of trellis' and poles for every crop. Growing vertically means more space, and can lead to healthier plants. Disease and critters that hang out at ground level struggle to make the journey upward where they meet wind, sun, and rain that can effectively weakens or destroy them. 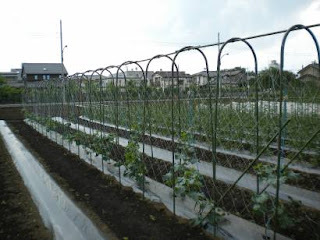 Trellising can also mean that as we weed, prune, and harvest that problems quickly become apparent. For example, stems broken by heavy winds this past weekend were spotted quickly and remedied. And just as easily we can discover the pleasures, i.e. the bean's first orchid-like blossoms and tiny, sliver-thin baby beans barely longer than my fingernail. The cucumber trellis is a fairly simple affair erected in just a few hours. Narrow inverted u-shaped structures run along the sides of the bed, spaced roughly every two or three feet. Made from the standard green poles used for everything from staking beans and tomatoes to creating the eggplant's cathedral-like structure, the poles can be seen at farms everywhere here. A little u-shaped attachment fits snugly over the top creating a secure arch. To these a “cross beam” made of the same poles “linked” together runs across the center line of the arches. 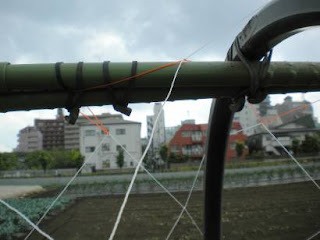 A rubber band with a sort of bobble at the end secures each pole to the arch as well as to the next cross-beam. Once the beam was set we double-checked for straightness and to make sure each arch met the cross bar. Where it didn't we pushed and pulled it down to set it evenly as well as snugly. Then we wrapped more rubber bands around the ends to further strengthen and secure the structure in anticipation of the increased weight of the vines as well as any weather. (Something that paid off when the recent typhoon blew through.) As the vines fill out, I imagine the trellis will become a sort of green edifice in the middle of the farm that the wind will steadily attempt to topple. Two poles on either end of the structure set in at angles and held with thin wire reinforce the whole. Over all of this we strung a net that essentially hangs to the bottom on both sides. We ran the base string out first, and then put the ends through the loops on the bottom of the net on either side. This saved us from trying to sew it through after the net was up. It also gave us a bottom 'rail' when it was finally time to spread the net out entirely. We then tied the base string to each end pole. Once the net was secured to the farmer's satisfaction, we placed the vines. Planted nearly three weeks ago and kept under row covers until just recently, the vines thrived. 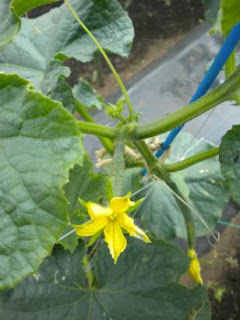 Some already possessed the signature yellow trumpet-like flowers while still others showed off tiny cucumbers. These first were slightly mottled in appearance, which I'm betting was due to the then irregular rains. (Now that the rainy season is officially underway in what seems like unending precipitation it may be a non-issue.) Working both sides of the structure we alternated which plants went right or left. This ensures both balance in terms of weight but also plenty of room for the vines to grow and spread. Gently lifting them up we set them in place on the nets, making sure that none of the plant remained on the plastic mulch below, but at the same time wasn't strained in it's stretch to it's new place. A second stake stretching from the base of each plant to the net was set for more reinforcement. The vines, while presenting a prickly exterior on vine and leaf that makes one wish for sturdy gloves and long pants, are also surprising fragile. Hollow as they are one wrong move can result in a break that disrupts the flow of nutrients from roots to leaves to fruit and back again that opens the door to illness, low-productivity or straight up death. Got a good rigging system for growing vegetables in small spaces? Do tell! I can see why this post would be popular!!! Hurrah for urban farming. I love cucumbers. Thanks you two! I love them, too, but I have to say I think I almost love them more for this trellis. It's just so cool! I tweeted this. Cucumbers somehow rarely work for me in my upstate NY garden but this is good advice, and I hope some of my Twitter followers can use it.